All transactions are safe and secure with a reliable history in online purchasing behind each of our associates. Buy the Mr. 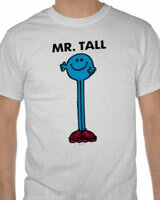 Tall t-shirt to own Mr. Men clothing and merchandise. Everyone has a part of their body that they don't like. For most people it is their nose, hair or stomach, but for Mr. Tall it is his extra long legs. In this Roger Hargreaves book, Mr. Tall learns that everything can either be good or bad, depending on how you look at it. Some people wish they had what you have (I wish I had extra long legs). If tall is your type then get this Mr. Men tee. If you like muscles then grab a Mr. Strong t-shirt today. In addition to the Mr. Tall tee above, browse the Mr. Men Clothing Gallery for more apparel like men's and women's clothes, kids shirts or hoodies.